Celebrate the 2018 Winter Olympics with kids using this FREE printable challenge that can be used as a teaching resource & lesson plan guide or just for fun with your family as you enjoy the Olympic Games together! There's so much to learn during the 2-weeks of the Olympics -- it's a great time to introduce geography, cultural activities, STEM projects and more! And we've got an AWESOME way to inspire your kids or students to do more than just watch the events! 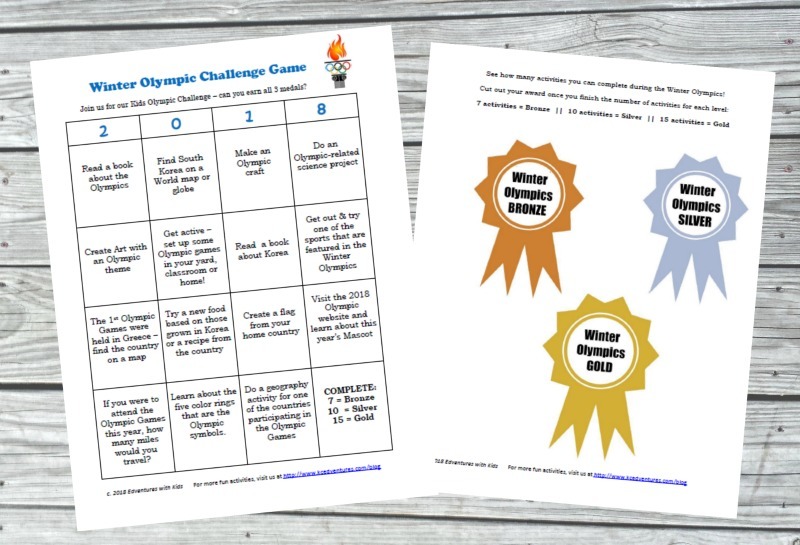 Grab your FREE printable copy of the Winter Olympics Challenge -- complete with bronze, silver & gold medals -- and see how many 'events' you can complete before the closing ceremony. The challenge can be used with kids of all ages -- from preschool through middle school -- and includes activities that cover science, geography, art, history, reading, math, physical activity and cultures! 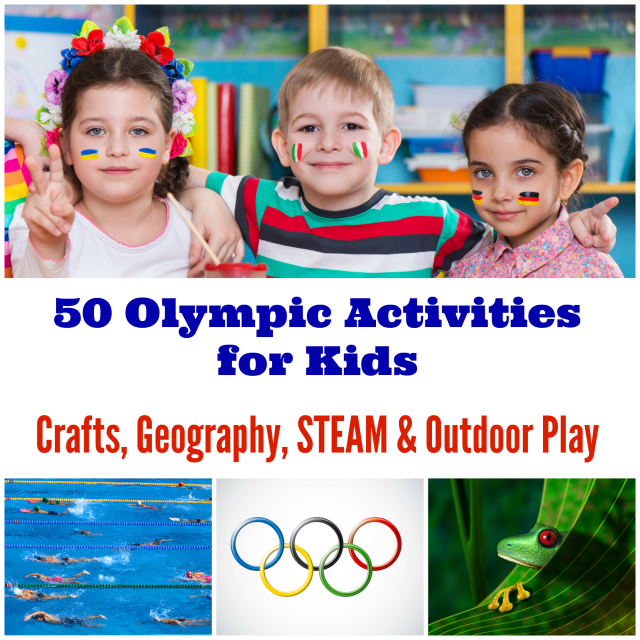 We've listed each of the 15 challenges below along with activity ideas, teaching resources and affiliate links to items that are perfect for the learning about the 2018 Olympic Games. Plus a FREE printable bingo-themed Olympic Games Challenge kids will LOVE and medals they can earn as they complete the different activities. South Korea is hosting this year's Olympic Games. Our geography and cultural activities focus on the host country, the original Olympic Games & symbols and map activities. We use a Kids Dry Erase World Wall Map when we want to record items -- for example, when we map our summer reading activities. We also have a Kids Desktop Globe which is great to use when you're discussing time zones or lines of latitude and longitude. If your short on space, try this Inflatable World Globe . We also love using a Explore the World Placemat World Map placemat or Mini globe Mini Tilt Globe. Find South Korea on a World map or globe. The 1st Olympic Games were held in Greece – find the country on a map. Here's a list of 10 Map & Geography Activities to inspire you! Learn about the five color rings that are the Olympic symbols. Try a new food based on those grown in Korea or a recipe from the country. Ordering or visiting a local Korean resturant would also be a fun activity! It's always great to get creative so think outside of the box (eg. not just coloring) when it comes to Olympic arts & crafts! Create a flag from your home country -- you can use these free Flags of the World coloring pages as a guide. We chose to make the Olympic Rings using items from nature for our art project. Another great challenge is to make a recycled art project of the Olympic rings or torch! 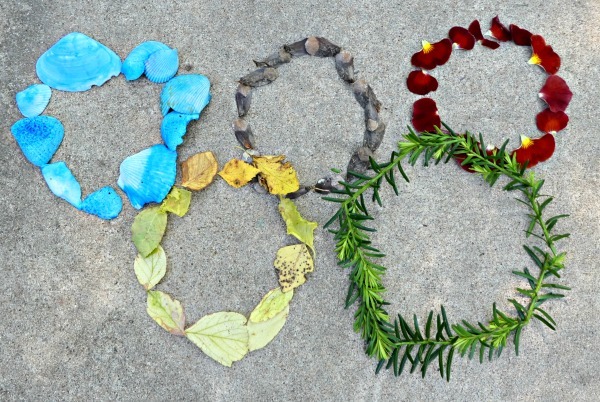 Make an Olympic craft -- visit our Olympic Games for Kids pinterest board for lots of ideas! The NY Times has some excellent resources for teaching the physics behind many of the Olympic sports! If you were to attend the Olympic Games this year, how many miles would you travel? This math challenge can be computed in many ways -- how many airmiles (or 'as the crow flies'), how many land miles (measuring on a map or globe) or make it super-challenging and have students figure out how they would get to the Olympics and add up all forms of transporation for their trip! Read a book about the Olympics -- see these 11 Winter Olympic Books & Activities for a few of our favorite reading choices! Read a book about Korea - any book! Non-fiction is great but there are some wonderful fiction stories that would be perfect for the challenge. Another AWESOME reading challenge would be to read books about all the countries participating in the Winter Olympics! 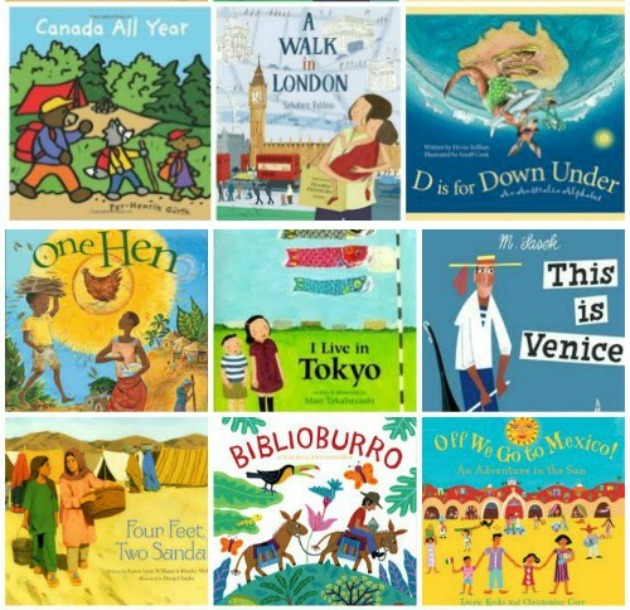 Here's a great list of 30 Picture Books from Countries around the World to get you started. Get out & try one of the sports that are featured in the Winter Olympics. Some of the easier ones to try with kids include cross country skiing, skating, a modified bobsled or luge ride and even curling! Even if you don't have snow & ice, you can recreate some activities -- try using paper plates as skis and see if you can slide across the grass or floor. Get active – set up some Olympic games in your yard, classroom or home! Try these7 Olympic-themed Activities that get kids moving! Download your FREE printable Olympic Games Challenge with medals and get started!! You'll receive an email with a copy of the 2018 Winter Olympics Challenge along with printable medals that can be used as kids complete the various activities.